My husband and I lived for years on the edge of the Sahara desert working in the country of Chad. 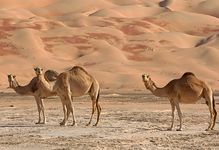 We saw camels everywhere because there are many nomadic groups in that region. Wherever you see nomads, you are going to see camels, because nomads love their camels. One day we had guests in our home – a nomad chief and his friend. They told us something that let us know just how highly nomads think of their camels. Muslims say that there are 100 names for Allah, but only 99 names are known to man. The nomads believe that the camel is the only being who knows the 100th name of God. That is why camels have such a haughty look and always seem to be looking down on us! When we look through the 99 names of God, many are magnificent and glorious names. As my husband and I thought about it, we realized that we also know what the camel knows. We too know the name of God that is missing from the list. It’s not Jesus or Emmanuel. It’s “Love.” But this it not the whole reason Allah told the camel the name. He did it so a Muslim would always look up to Allah. A human being can know everything about Allah except this one name, which makes Allah more superior than any human being. Isa, or Jesus, is called Emmanuel, which means God is with us (Isaiah 9:14; Injil, Matthew 1:23). You are right that God is Love. Interesting reflection! I also think that the 99 names are for sure beautiful descriptions of God! Interestingly, Zabur, Psalm 148 and Psalm 19 in the Bible taught us that His entire creation praise His most precious names without a speech (Zabur, Psalm 19:3). Zabur, Psalm 148:10,13 say that “all you domestic animals” , “Let them praise the name of the Lord, for his name alone is exalted; his majesty is above earth and heaven.” Among all those domestic animals is camels. Isa preaches that God’s purpose is to restore the relationship between mankind and Himself and He invites us to have a closed relationship with Him through Isa Al-Masih (Injil, John 17:6). “Muslims say that there are 100 names for Allah, but only 99 names are known to man.” Please show proof from Islamic religious books or scripture. It’s written in the Hadith, Sahih al-Bukhari 50:894. These Hadiths don’t explain the one hundred Names of Allah. But one hundred minus one which is ninety nine. 100 names of Allah is a common discussion among Muslims. If this is not important, why did Muhammad have to reiterate that “ninety nine is one hundred minus one”? (Hebrews 6:18) – It is impossible for God to lie. Jesus is more than a prophet because Jesus is alive and eternal. He will returns to complete the mission of Allah as the Judge (al-Hakam), one of Allah’s 99 names. Jesus is the just ruler and fair judge, all the names of Allah.